B.I.R.M. 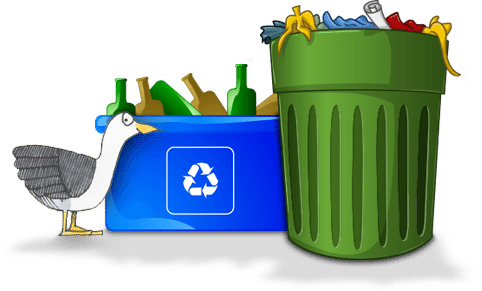 provides trash and recyclable pickup for homes and businesses. Extra weeks post and prior to Summer Season Pick-Up occur on Wednesday (once a week). Sign up to apply for Block Island Recycling Management's residential and business trash and recyclable pick-up. Please provide an accurate description of location of the house where service is to be provided and location of trash/recyclables to be picked up. Based upon your selection you will have different information to input. Please choose which type of pick-up you need. A yearly pick-up contract is billed monthly at $75/month for a total of $900.00 for the year. Pick-ups are once a week on Wednesday. We will contact you to begin your pick-up schedule once we receive your application. Our seasonal pick-up service begins on June 1 and ends September 15. Pick-ups are twice per week and is $525 for the season. You can add months before or after for $75/month. Pre- and post-season pickup is once per week on the weekend day of the pick-up schedule you choose below. You can schedule a one-time pickup for any day of the week for $45. Please choose the date you would like pick-up from the calendar below. Please let us know which days you would prefer to have your pick-ups scheduled. If you would like pick-up service prior to the June 1 start, please choose the number of months required. If you would like pick-up service after September 15 end, please choose the number of months required. Please choose the date you would like to have your trash and recyclables picked up. We're open to your questions and comments.